I knew that I would be going to the NY Air Show with some friends and would need to use a long focal length lens. The last time I’d tried to capture aircraft in flight I hadn’t been particularly successful – and these were WWI vintage aircraft that didn’t move particularly quickly. This time there would be fast jet aircraft (AV-8b Harrier, F/A 18 Super Hornet, F-22 Raptor etc.) so I didn’t give much for my chances without some practice (or even with it for that matter). Anyway out came the Sigma 70-300mm f4-5.6 – The longest lens I own. Since this is a Sony/Minolta A-mount lens out too came the Sony Alpha 500 – a camera I’m getting to like more and more as I use it. Down I went to the dock where I’d seen a Cormorant standing on a rock on the lake. It was a good distance from our dock and I thought it would be a suitable subject – it wasn’t moving much and I thought it would be a good opportunity to try out the lens without worrying too much about the movement. 1. I can’t handhold at long focal lengths. So out came an old monopod. 2. The monopod by itself helped but the pan/tilt head seemed to get in the way so I put on the ball-head from my tripod. This gave me much more flexibility while still providing stability. 3. This really is a sunny day lens. I took the pictures late in the afternoon and had to bump the ISO up to 800 in order to get a decent shutter speed. This increased the noise. 4. At 300mm the lens is very soft even at small apertures. 200m was better. 5. Using continuous autofocus seemed to work better than single shot. Even though the subject wasn’t moving maybe I was. 6. 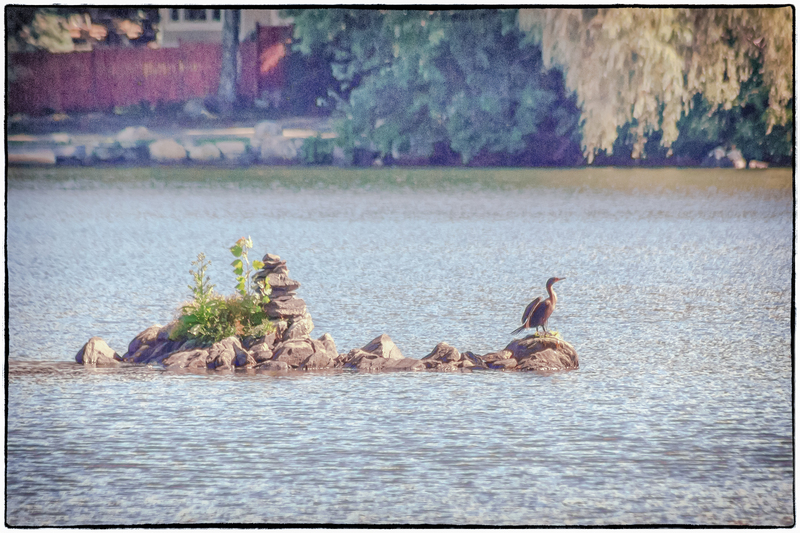 The sun was behind and to the side of the cormorant and it was difficult to get the exposure right. Spot metering seemed to help but even then the subject was often too dark requiring shadows to be boosted in PP and more noise. So not much of a picture, but a useful exercise. We’ll see how I do at the air show.